Rent villas and apartments in Playa del Inglés, Gran Canaria with private pools. Book affordable holiday rentals that are near a beach and golf course. Modern duplex in the heart of Playa del Ingles, south of the Island of Gran Canaria, in a quiet residential and central area. Located less than a 10 minute walk from supermarkets, shops and beaches. A very private apartment overlooking the sea, a minute or so from the beach, restaurants and bars. Set in mature gardens with large balcony for a quiet and relaxing holiday. 35 mins from the airport. This 5 bedroom villa with private pool is located in Playa del Inglés and sleeps 10 people. It has WiFi, air conditioning and barbeque facilities. Modern apartment with Sea Views. This 3 bedroom villa with swimming pool is located in Playa del Inglés and sleeps 5 people. It has WiFi, air conditioning and barbeque facilities. This 1 bedroom apartment with shared pool is located in Playa del Inglés and sleeps 4 people. It has WiFi, a garden and barbeque facilities. This 1 bedroom apartment is located in Playa del Inglés and sleeps 2 people. It has WiFi and air conditioning. This 2 bedroom villa is located in Playa del Inglés and sleeps 3 people. It has WiFi and air conditioning. This 1 bedroom apartment with swimming pool is located in Playa del Inglés and sleeps 2 people. It has WiFi and air conditioning. 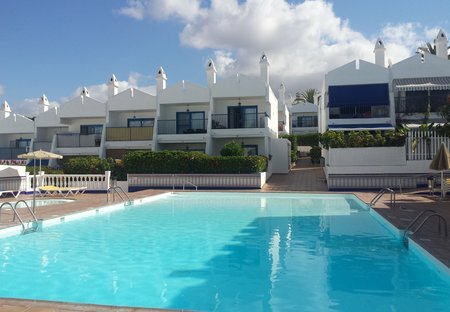 This 2 bedroom apartment with swimming pool is located in Playa del Inglés and sleeps 4 people. It has WiFi and air conditioning. This 6 bedroom apartment with private pool is located in Playa del Inglés and sleeps 11 people. It has WiFi, a garden and parking nearby. This 2 bedroom apartment with shared pool is located in Playa del Inglés and sleeps 4 people. It has WiFi. This 3 bedroom apartment with swimming pool is located in Playa del Inglés and sleeps 6 people. It has WiFi, parking nearby and a gym. This 2 bedroom apartment with shared pool is located in Playa del Inglés and sleeps 3 people. It has WiFi, a garden and parking nearby. This 1 bedroom apartment with shared pool is located in Playa del Inglés and sleeps 3 people. It has WiFi, a garden and barbeque facilities. Looking out on the Veril Playa beachfront in Maspalomas, Casa Verde Mar is perfect for a seaside break on the south coast of Gran Canaria. Up to 10 guests can enjoy this stunning holiday home. This bungalow with swimming pool is located in Playa del Inglés and sleeps 4 people. It has WiFi, air conditioning and barbeque facilities. Modern beach apartment that sleeps 2, located on Avenida de Tirajana, central Playa del Ingles. Enjoy beautiful views from the balcony, while the shops and restaurants are within walking distance.